Get ready for an enchanted adventure at RegalWins.com! Take a walk through the dark woods and discover magical offers filled with big bonuses, spins and cash! There's two paths to pick from. Will you take the journey with Red Riding Hood or Hansel and Gretel? 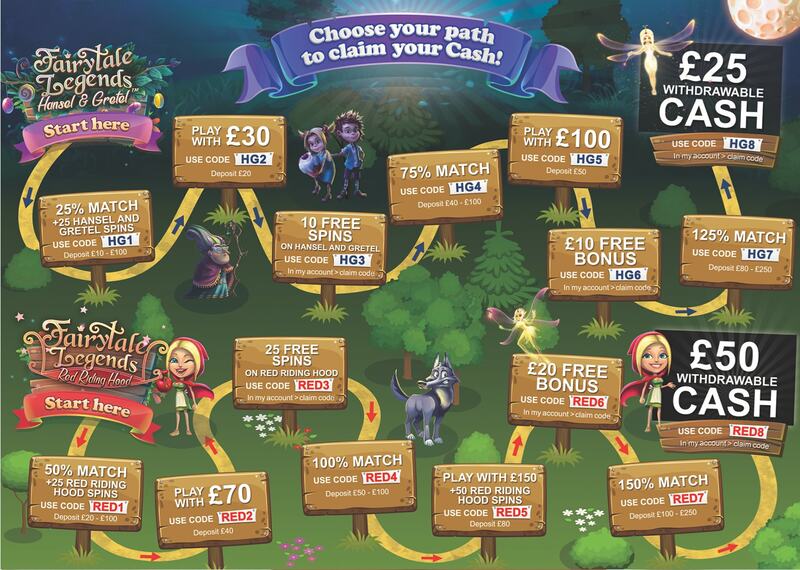 Pick your path and be rewarded with up to £50 withdrawable cash! T&Cs: Promo is available for funded players only. This is a chained promo with two chains to pick from: Hansel and Gretel or Red Riding Hood. The offers must be claimed in order. For example, RED1 must be claimed before RED2 can be claimed and so on. Each offer requires a min deposit and a promo/claim code that is specified. All bonus offers can be played on slots (exc. progressive jackpots) and carry a 25x wager requirement on deposit + bonus amount. All free spins offers can be played only on Fairytale Legend (Hansel and Gretel & Red Riding Hood) slots only and carry a 25x wager requirement on the winnings. Per promotion, bonus winnings up to a max of 5x the bonus amount can be converted to real, upon completion of wagering requirements original bonus amount will be void. £25 and £50 cash prizes have no wager requirements and can be withdrawn. Please enter the respective claim code shown in the claim code area of your ‘My Account’ page before the promo end date. Promo is valid between 28/09/2017 and 23:59 13/10/2017. Management have the right to withdraw the promo without prior notice. General Promo Terms and Conditions apply. Standard Terms and Conditions apply.